A short opportunity in the midst of some very changeable weather over the past couple of weeks to sneak off for a few hours and take some shots. We’ve had a few days of “proper” winter, with snow and ice and the predictable initial chaos on the roads making it hard (or at least unpredictable) to access the most scenic parts of the country, Great to look at, harder to navigate. The short interlude that I could manage allowed me to head across central Scotland to Falkirk, at the head of the Forth & Clyde canal, where we are now fortunate to have the Kelpies, the magnificent and massive equine sculptures by Andy Scott, my first opportunity to see them in the flesh, so to speak. 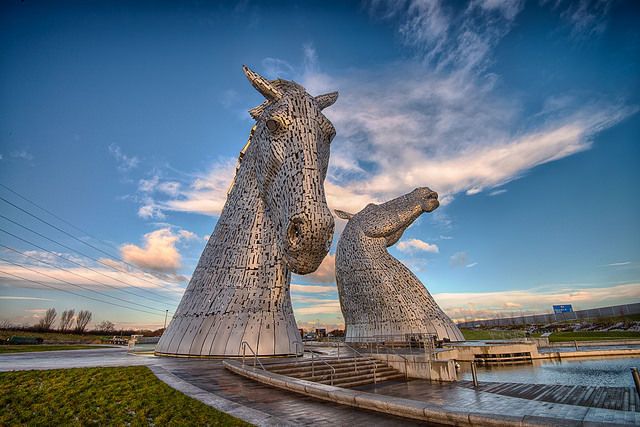 I had the pleasure of meeting the artist himself a couple of years back when the Kelpies were a work in progress and at the time it sounded like an insanely ambitious project, but Andy is a man of rare talent and his sculptures have become a striking part of our landscape. It’s not often that taking a few pictures on a cold and quiet early Sunday morning generates much excitement, but my self-absorbed concentration was interrupted by a noise in the middle distance, and the sight of a few passers-by breaking into a run. Photography abandoned, I found two guys at the canal’s edge attempting to rescue a dog-walker who had stepped down onto what he thought was a small, icy puddle that turned out to be a good bit deeper. Fortunately man and dog both were pulled successfully from the unwanted ice bath, and able to head off to a car to find towels and dry clothes. All of which is entirely impossible to discern from the quiet and serene Kelpies shots, drama undocumented visually. Maybe I should take up photojournalism.